Our October guest editors, the design team of Timo Weiland, are experts at outerwear. Seriously, have you seen their coats? So, it goes without saying that we’d pick their brains (specifically, Timo himself) about buying the perfect fall coat. theFashionSpot: What do you think makes a great coat? Is it the cut, the fit, the color or pattern? All of the above? tFS: What’s your favorite coat for women in your fall collection? TW: The ombre animal printed fur jacket (pictured) is my favorite. 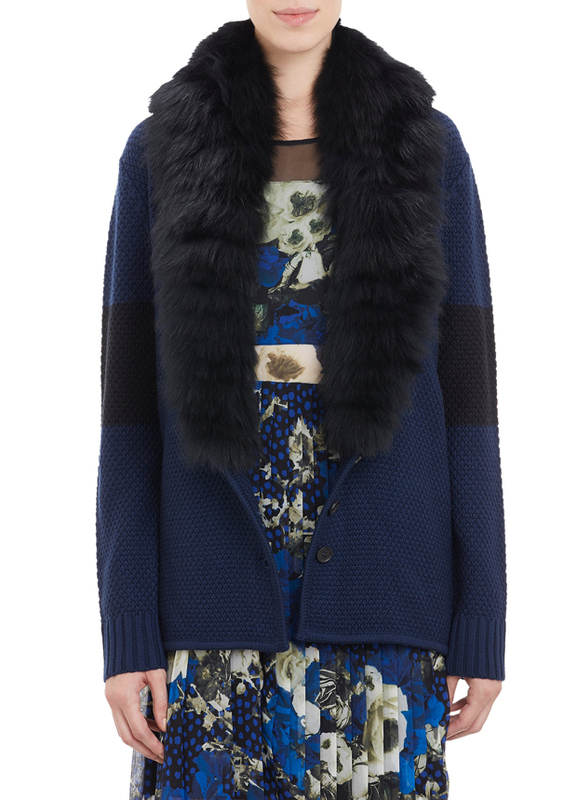 We did a vest version for Barneys this season! tFS: Let’s talk coats for body types because this is where we all have issues. If you have an athletic build, what kind of coat shape works? TW: The best coat for an athletic body type is a tailored V with slim arms, so that the image is clean and trim rather than bulky or oversized. tFS: And if you’re curvier up top, is there a better type of coat? TW: The tailored V shape is also better for the curvier top because it is slimming, but could also accentuate if there is a waist belt or peplum at the high-point midsection. tFS: Is there one coat style that works for all? An A-line perhaps? TW: I do not think that there is one coat that works for all shapes and sizes — though a subtle A-line would work best for a slim to medium frame build. A textured knit coat could also be flattering because of the stretch flexibility. We did a version that’s at Barneys. tFS: Is there a coat we should avoid? Like do double-breasted ones look good on anyone? TW: Traditional double-breasted peacoats can be gorgeous, but aside from that, a tailored or more relaxed single-breasted coat is the best option for most body types. tFS: What’s your favorite fabric to use for outerwear? Anything that’s underrated that we should give another glance to? TW: Novelty tweeds and jacquards are my favorite. I also enjoy leather trims! tFS: What’s your stance on capes: Pro or against? tFS: Is it possible to find a great coat under $100? TW: Yes, it is possible — either on final sale or on sites such as Topshop, Nasty Gal or ASOS. Uniqlo may have some solid options as well. tFS: And finally, what coats are you guys wearing? TW: We always wear TW coats from various current or past seasons. Some of our most interesting styles were dropped because they unfortunately are not as salable due to details or price point. The silver lining there is that we get to wear statement pieces that showcase TW during the cold months ahead!